Plant-based Meat Market Segmented By Product Type - Tofu, Tempeh, Seitan, RTC/RTE, Natto; Source - Soy-based Meat Alternatives, Wheat-based Meat Alternatives, Mycoprotein Meat Alternatives, Other Sources of Meat Alternatives; End Use – Retail, Industrial; Distribution Channel - Business to Business, Business to Consumer (Modern Groceries, Convenience Stores, Food & Drink Specialty Stores, Traditional Stores, Online Retail). According to WHO (World Health Organization), in 2016, more than 1.9 billion adults aged more than 18 years were overweight. Most of the world's population lives in countries where overweight issues and obesity kills more people than underweight issues. The intake of high-fat content food products and a decrease in physical activity due to the increasingly sedentary nature of many forms of work are the fundamental causes of a rise in the rate of obesity around the globe. As a result, consumers are now being conscious on the type of food that they are consuming, and are simultaneously taking the necessary steps on cutting down on the unnecessary intake of fat content and high calorie content food products in their regular diet. Consumer are now adopting a reduced intake of meat products, and are seeking health benefits due to the consumption of plant-based meat products. Plant-based meat product promotes several health benefits such better heart health, improved gut health and weight management. Over the past couple of years, global Internet penetration has been surging year-on-year, providing easy accessibility for the consumers regarding any information and awareness on any sector. Internet penetration has been an influential factor contributing to the growth of plant-based meat products in terms of value sales. Consumers are becoming more and more aware on the health benefits associated with the consumption of various healthy foods such as plant-based meat products through various social media channels. Through these online channels, there is growing awareness on animal cruelty and health issues, which have an adverse effect on the buying decisions of consumers, especially in developed regions such as North America and Europe. Owing to these factors, plant-based meat products enjoy a status of a lucrative intersection between these changing social dynamics. In 2012, the vegan population accounted for around 25.6% of the global population. Among the vegan population, tofu is perceived to be the most similar plant-based meat product, and consequently, other soy food products like tempeh are also gaining popularity due to its texture, chewiness, and sensory attributes in plant based meat product segment. Plant-based meat products like tempeh and tofu also offer an economic benefit, right from the agricultural to the commercial class in countries like China and South East Asia, where it is also produced as a means of earning a livelihood. The demand for tempeh and other plant-based meat products is slowly outpacing the supply of soybeans, which is the major raw material. Therefore, manufacturers are turning to native ingredients such as lupines to produce plant-based products like tempeh. An increasing number of lupine tempeh and other multigrain tempeh incorporated with lupines are emerging on retail shelves. Major lupine processors are very passionate about the advancements in the lupine industry. They have successfully marketed lupines for the production of tempeh in various countries. Tempeh plant based meat consumption is mainly high in Eastern Australia, where soybean production is also high. As lupine is a native pulse of Australia, lupine tempeh is gaining popularity due to the moderate demand for tempeh in Western Australia. Hence this factor provide a critical opportunity for plant-based meat market to gain traction. 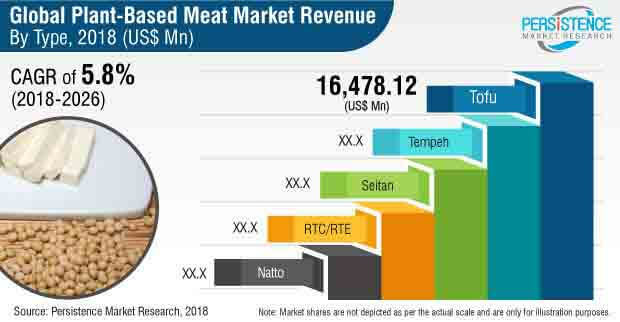 On the basis of region, the APAC region accounts for a higher value share in the global plant-based meat market in terms of value sales, due to the ever-rising consumption rate of plant-based meat products in the region. China has been a dominant region for the plant-based meat market in terms of consumption and production. Due to a rise in the concerns regarding obesity and consumers’ adoption for healthy lifestyle in North America, the region is expected to post comparatively higher growth, with a CAGR of 8.9% over the forecast period for plant-based meat products. Fry Group Foods (Pty) Ltd.